Buttons and pendants, candle holders, hair accessories and jewelry. Today's feature shop has it all! Everything from personal accessories to home accessories have all been brought together in this wonderful shop. ArzuMusa on Etsy is a shop filled with polymer clay creations that can fill every aspect of your life and add a little color and style to your surroundings as well as to your own personal style. Arzu is a wonderfully creative artist located in Istanbul, Turkey where she creates unique pieces of jewelery, accessories, home decorations and other creative pieces using polymer clay, glass, wood and metal. With her unique vision, she incorporates her love of color with her creative drive to share with us all a large collection of beautiful pieces you won't want to miss and will love browsing through. I'm especially drawn to Arzu's candle holders! 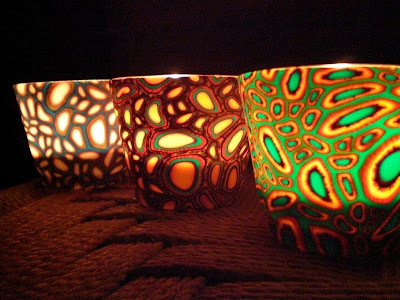 I love the semi-transparency of the clay that allows the colors to glow so brightly when the candles are lit. Her shop also houses some handmade buttons that are also on my favorite list! Now, if I could only learn to sew, I'd have all the inspiration I needed to put together a few new pieces of clothing to be adored! 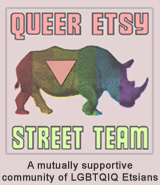 YOU CAN CLICK ON THE PICTURE ABOVE TO VISIT ARZUMUSA ON ETSY AND TAKE A LOOK AROUND OR, IF YOU PREFER, YOU CAN CLICK RIGHT HERE! You can also take a look around ArzuMusa's blog or stop by and visit Arzu on her Facebook pageTwitter! I think Polymer Clay creations are cool!